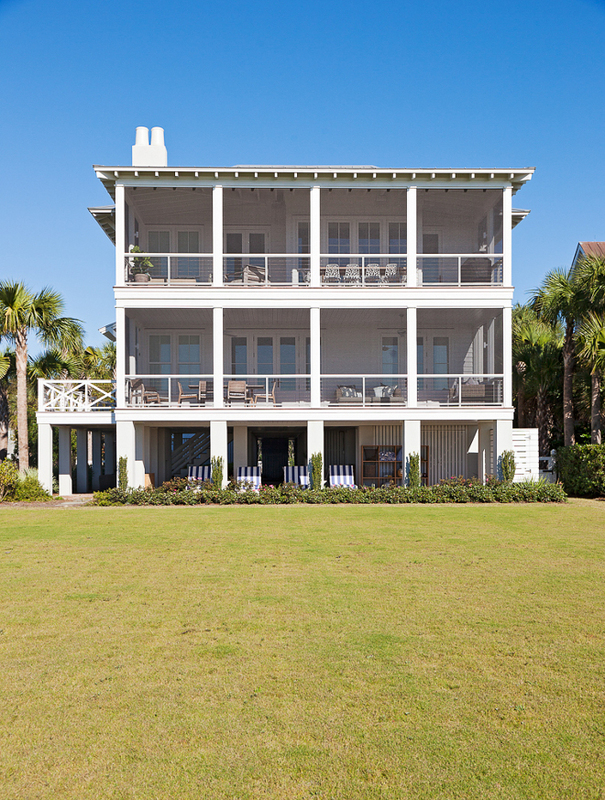 Located on historic Sullivan’s Island, South Carolina, just outside of Charleston, this beach house combines modern and historic design elements. 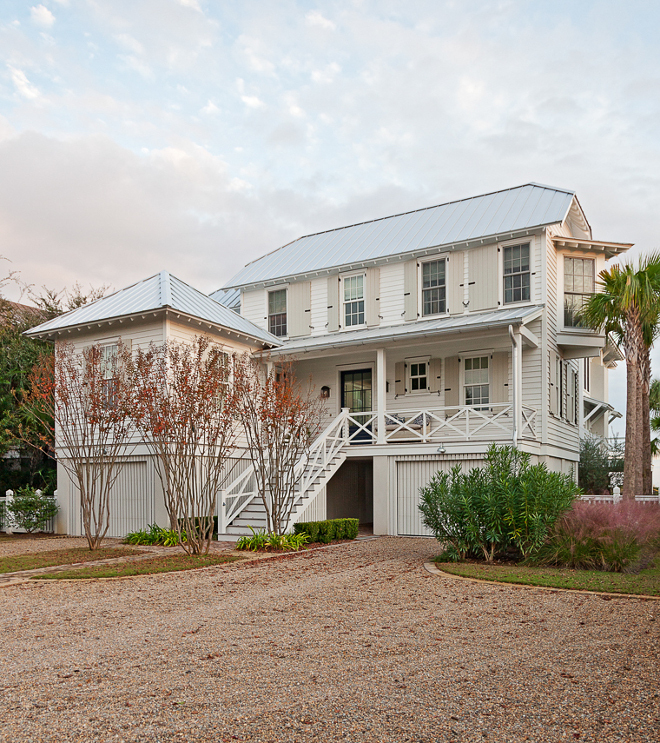 The clients wanted a old “lowcountry” style beach house feel and they wanted the beach house to have bright and open coastal interiors that were comfortable and welcoming to their guests. They also wanted it to work for their growing family and be kid friendly. Brilliantly designed by Beau Clowney Architects and with interiors by Jenny Keenan Design, this home also features a reverse plan, where the main living spaces and bedroom spaces for the family are on the upper floor to take advantage of the expansive views and the lower level is reserved for guests. Pin, save and share this incredible beach house. All of the details such as paint colors, lighting, furniture, flooring and decor have been shared by the designer. I hope you feel inspired! 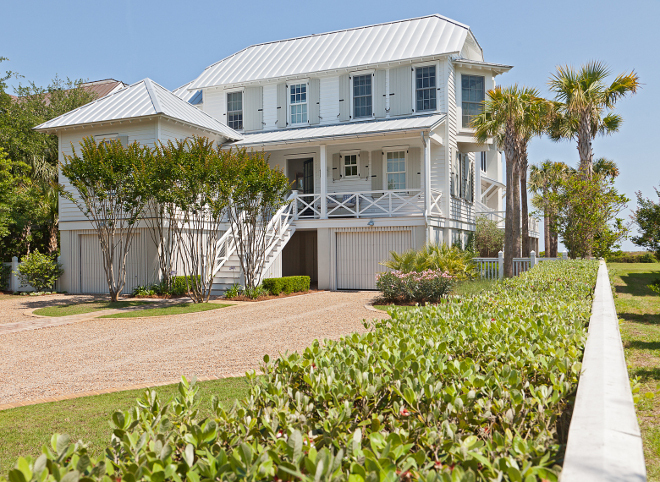 This is one of the most popular home exterior styles lately; white siding with metal roof. The white exterior paint color is Benjamin Moore Super White. Roof is Galvanized Standing Metal seam. 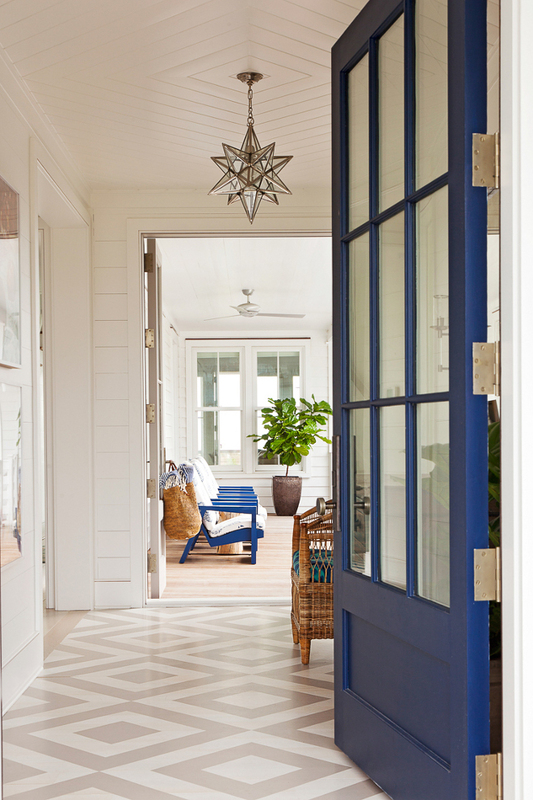 Navy Door Paint Color: Benjamin Moore Old Navy. 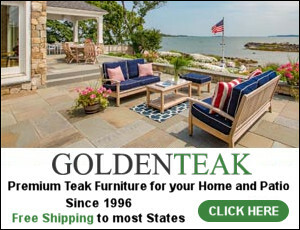 Blue adirondack chairs are from Sutherland Teak. 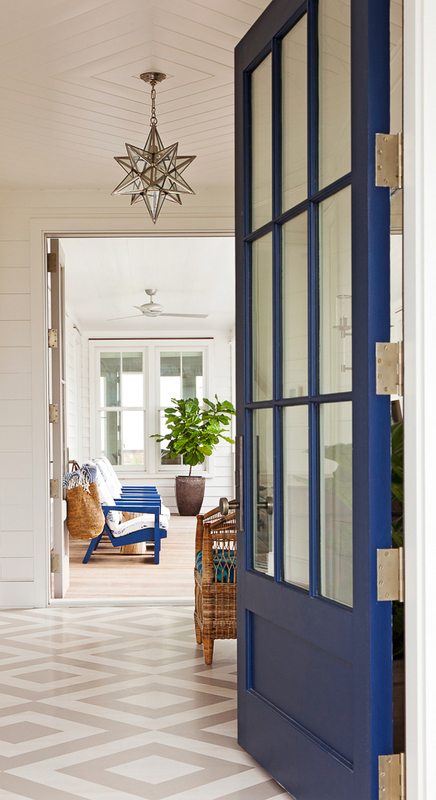 This coastal entry features a blue front door and painted wood floors. 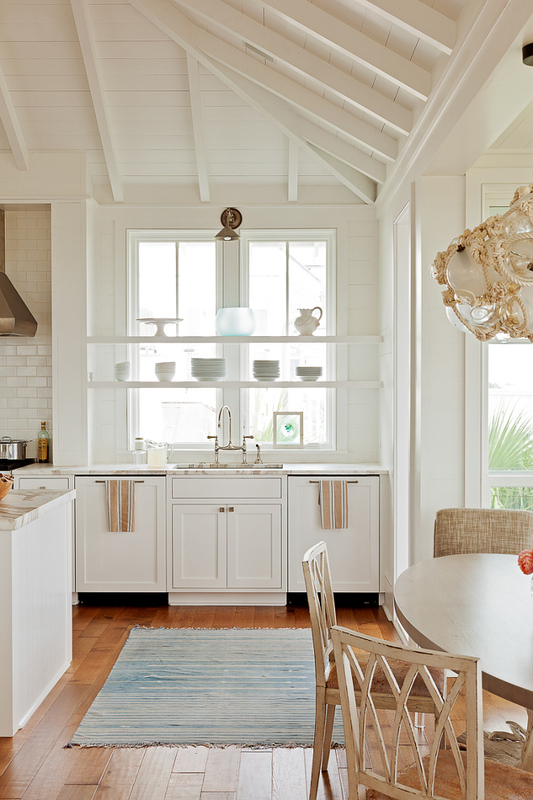 Star pendant is from Vaughn Lighting. 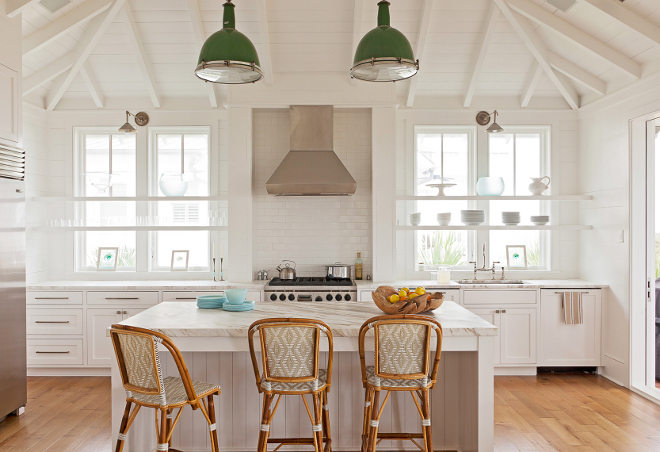 This is such a gorgeous off-white kitchen! Paint color is Farrow and Ball All White. 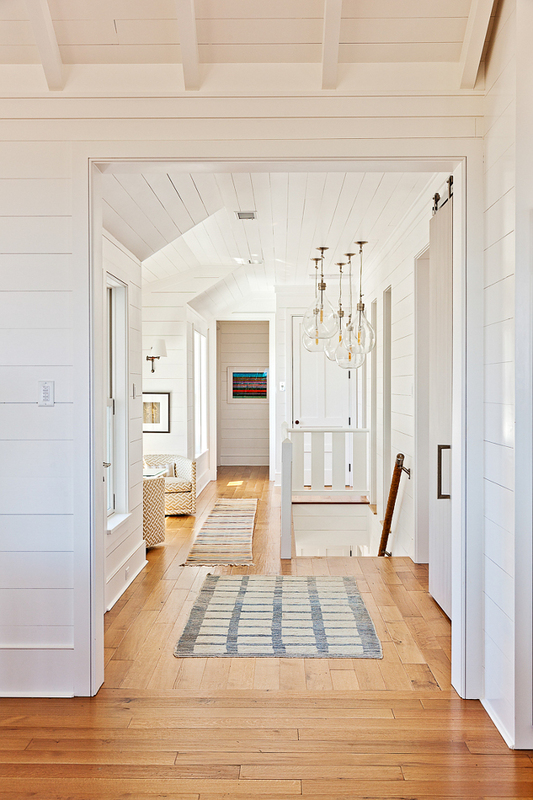 As you will see here, the whole interior of the house has wooden shiplap walls (mostly painted in Farrow and Ball All White) and shiplap ceilings. Barstools are by TK Collections. Kitchen features inset shaker style cabinets. The cabinets are painted maple and the kitchen island have a shiplap detail (see picture above). Kitchen faucet is by Rohl. 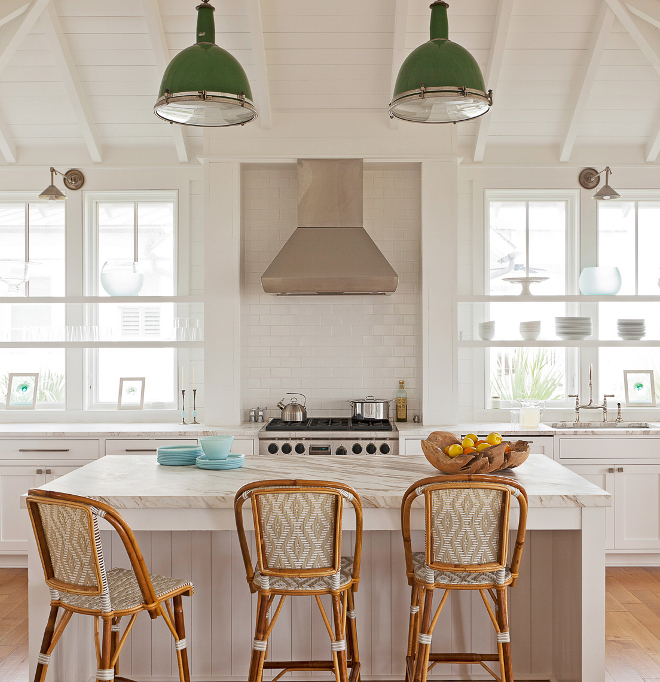 Kitchen lighting is vintage reclaimed gymnasium lights made into pendant lights and hanging from rope. How cool is that?! Kitchen sconces over shelves are from Urban Electric. Placed in front of the windows, these open shelves create some extra storage without compromising the natural light. 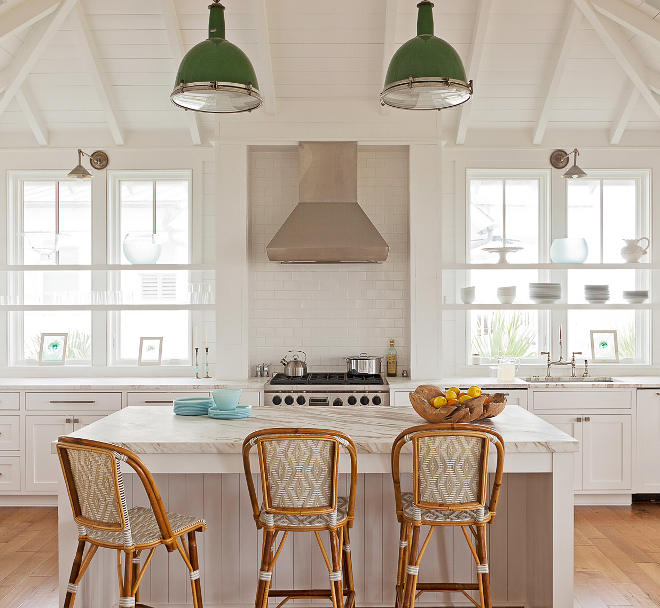 White china and glass keep the kitchen feeling neutral and airy. Countertop: The countertops are a white marble called Calacatta Belena. Backsplash: Sonoma Tile Makers, 3” x 6” in Star White Gloss. Cabinet Hardware: White Bronze from Rocky Mountain Hardware. The dining room feels surprising and organic. 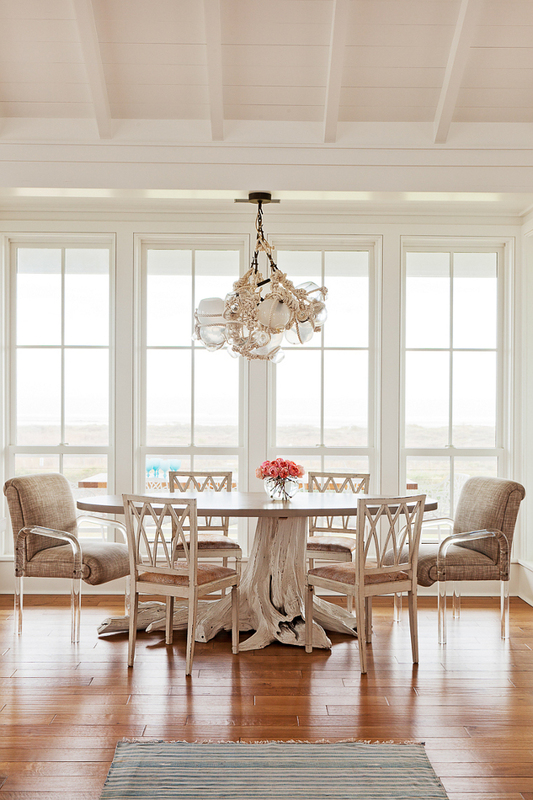 The glass and rope cluster chandelier is by Lindsay Adleman. The dining table is make out of an old cypress root by a local furniture maker and the dining chairs are antique. 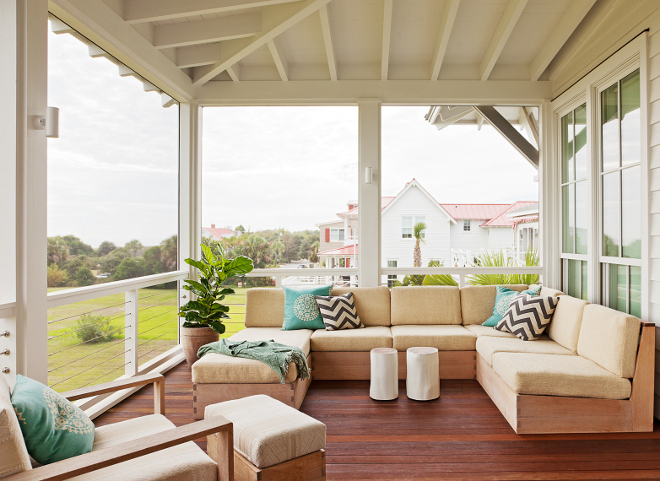 Just off the kitchen, the top floor screened porch is a favorite area from which to look out at the ocean. 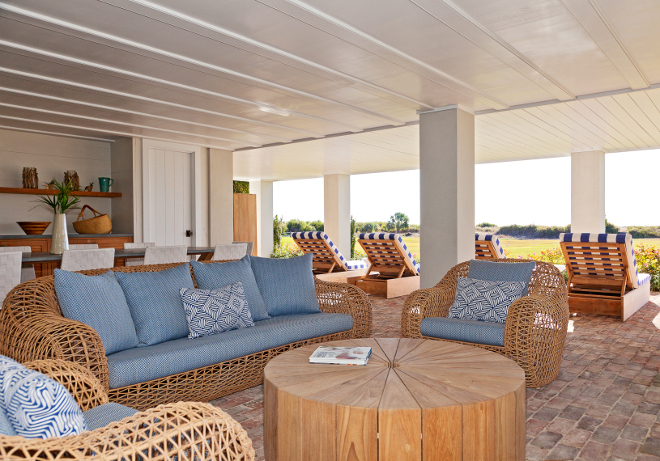 A sectional sofa suited for the outdoors offers plenty of comfortable lounging or entertaining friends. This porch also features exposed rafters and steel cable railing. 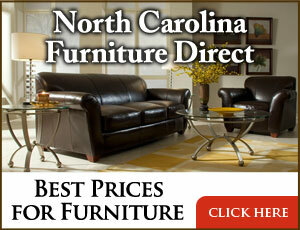 The teak furniture was custom made locally. The ceiling in the main living room is vaulted with painted beams. Chandelier is by Canopy Design. Living room chair is Verellen and fabric is C and C Milano. Notice the shiplap fireplace with Calacatta Belena surround. Living room sofas are Verellen – fabric is Kathryn Ireland. Coffee table is Ralph Lauren. Vintage Folding Chairs: Antique Dhurrie’s found at market. Seagrass rug is from Stark. Striped rug is vintage. Shiplap continues to be featured in the main hall. Flooring is engineered 6” White Oak Hardwood with a camel colored finish. Stairwell pendants are from BoBo Intriguing Objects. Hallway Nook Chairs: A.Rudin. Fabric: China Seas. 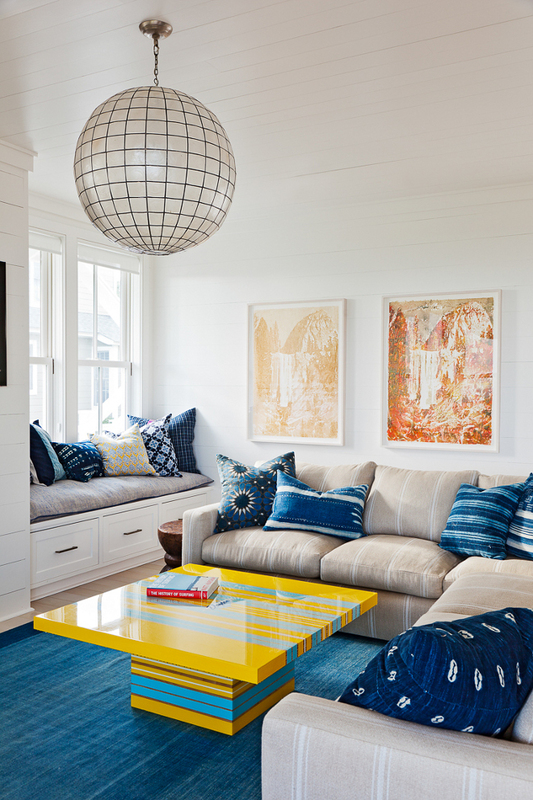 This kid’s family room is all about color and that outrageously gorgeous capiz shell globe pendant. Lighting: Globe Capiz shell ball Pendant – 1stdibs. What a fun bunk room! The bunk room features custom curtained bunk beds and rope bed handles. 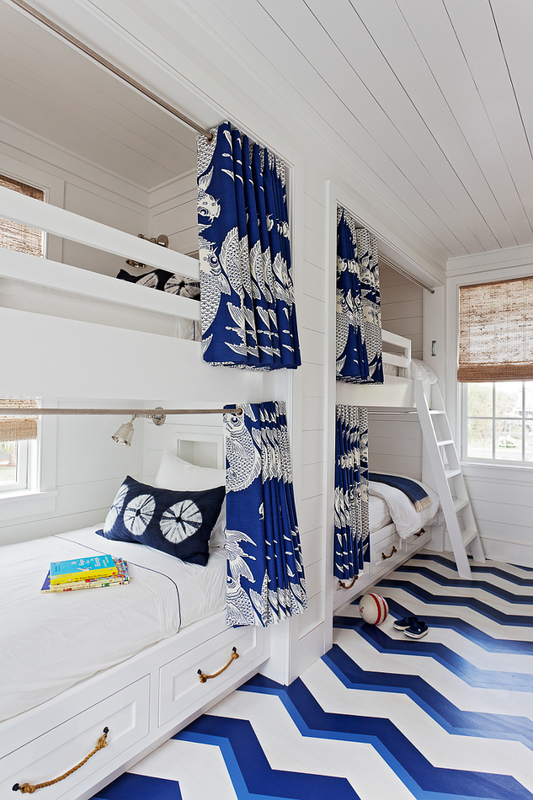 The floor is painted in a blue and white chevron pattern. Bunk bed sconces are Barbara Cosgrove. 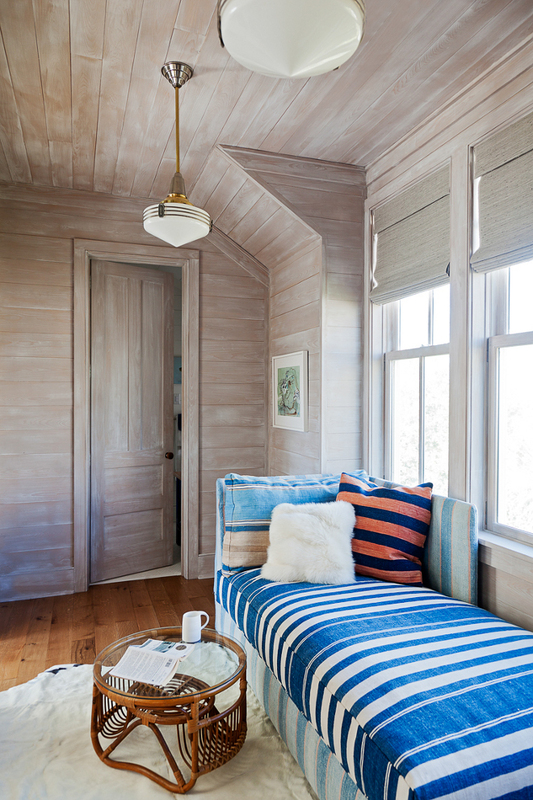 Places for overnight visitors abound in this seaside retreat -in the “office” there is a double-duty sleeper bench. Walls and ceiling feature a driftwood finish. Vintage Dhurrie rugs cover the chaise lounge in this space. 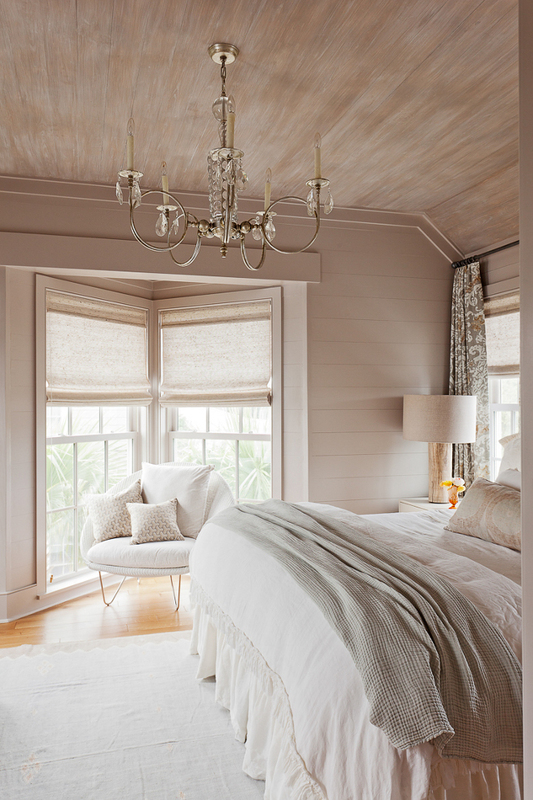 The double window sitting area expands the ocean view from the master bedroom which is elegantly decorated in a neutral palate. Paint color is Farrow and Ball Elephants Breath. Chandelier is Louise Gaskell Designs. Chair is Janus et Cie. Buoy lamp in tie dye room is vintage. What an amazing bathroom… Can you feel the serenity of this space? 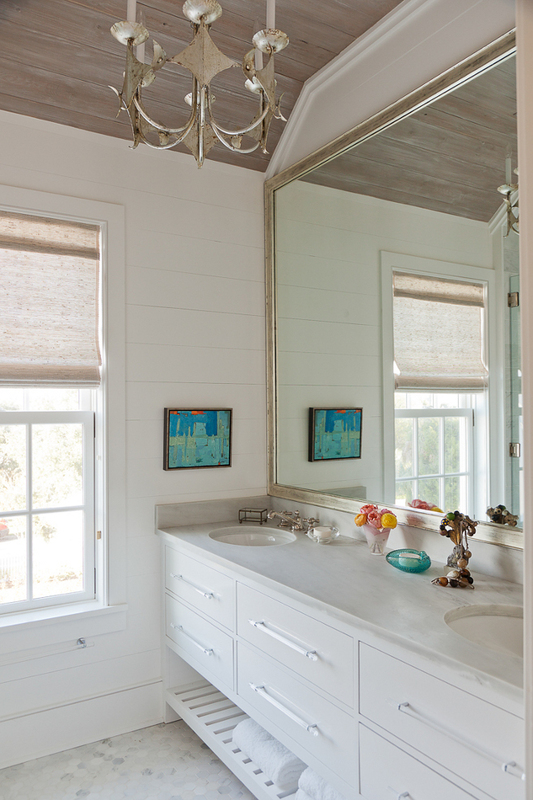 The master bathroom features white shiplap walls, washed shiplap ceiling and lucite cabinet pulls. The painted wood vanity features open shelf and Alabama White Marble top. 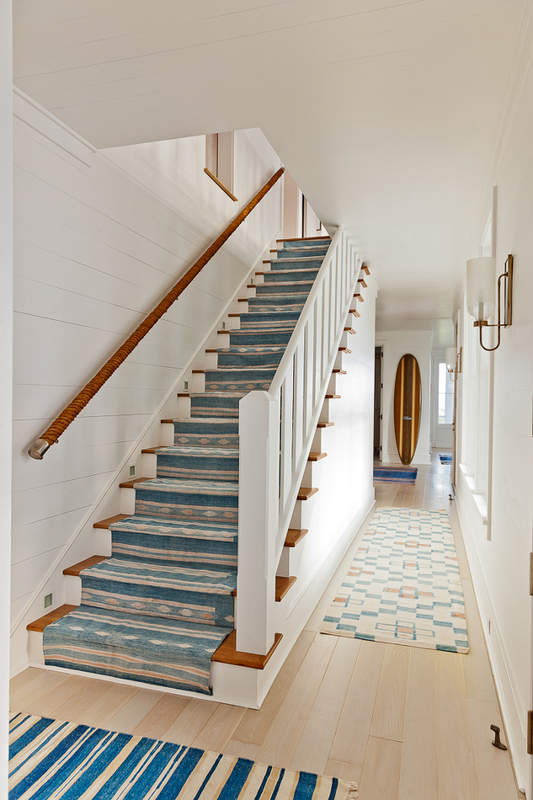 Leading to the lower level, this staircase fully embraces a coastal feel with rope railing and a vintage stair runner. Floors are 6” White Oak with a White washed finish. Stair runners were cut up old Striped Dhurrie rugs. The rope railing is made by a local craftsman. Outdoor furniture Janus et Cie. Patio flooring is brick. This is certainly a classic beauty! 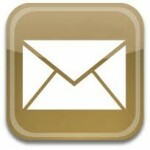 Landscape Design: Wertimer & Cline Landscape Architects. Photography is by Julia Lynn Photography. Thank you for being here today, everyone. It’s always a gift to have each and every one of you here. Have a Blessed day, my friends and we’ll talk tomorrow again. Sources: Beau Clowney Architects. Jenny Keenan Design. Wow…so many great finds. YOU are amazing! Love so much about this home! Thank you for sharing it. Have a blessed day Luciane, really appreciate you.